Very local, under hemlocks and in moist coniferous or mixed forests in sandy, strongly acid soils. 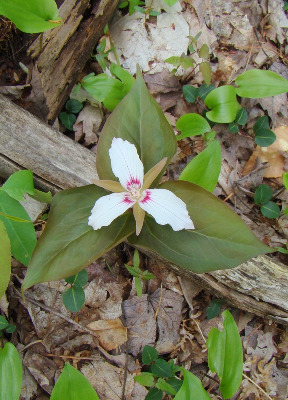 Trillium undulatum, barely entering Michigan from the east, is a rare plant of very restricted occurrence, though it has been known in St. Clair County since the First Survey in 1838 (perhaps suggesting that it was then common enough to be more readily encountered). 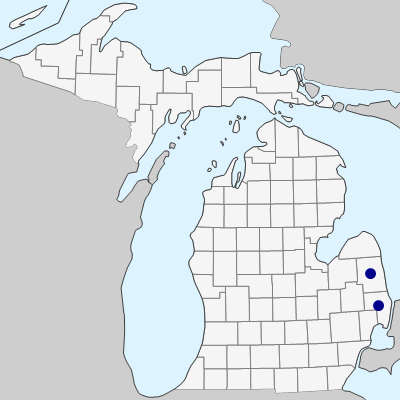 The old Berrien County record mapped in Michigan Flora, Vol. 1, is so far out of range as to be suspicious and is here not mapped. MICHIGAN FLORA ONLINE. A. A. Reznicek, E. G. Voss, & B. S. Walters. February 2011. University of Michigan. Web. April 21, 2019. https://michiganflora.net/species.aspx?id=2737.